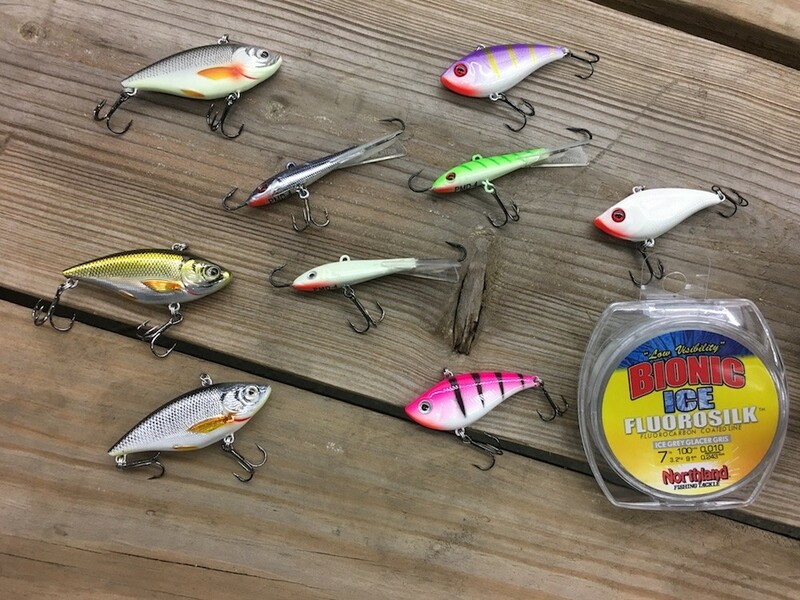 The magical first-ice period presents a unique opportunity for anglers to target hungry, active walleyes that in most cases haven’t seen serious fishing pressure in several months. And that opens the door for one of my favorite hardwater approaches of all—power fishing. This style of fishing is a fast-paced, fun way to quickly find and catch aggressive walleyes gathered on classic early winter structure such as points, shallow flats and humps, mid-lake reefs and river mouth deltas. It works on virtually all types of walleye fisheries, from prairie potholes to river-run reservoirs and the Canadian Shield. To fish an area you suspect holds walleyes, drill a series of holes that allow you to check different depths and contours. The idea is to hop from one hole to another, searching for walleyes active enough to rush in and attack. Each hole gets a few minutes to prove itself before you move on to the next. Big, noisy, flashy lures that call walleyes from a distance excel for power fishing. 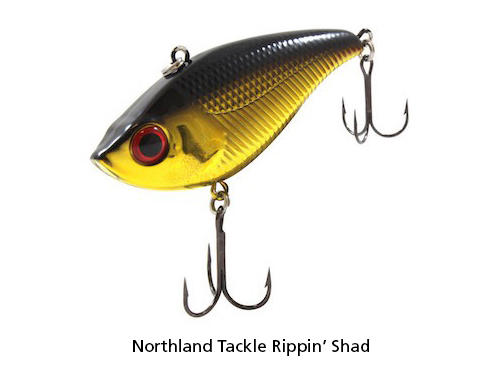 I favor two styles: swimming lures like Northland Fishing Tackle’s Puppet Minnow, and lipless crankbaits that perform well in vertical presentations, including Northland’s Rippin’ Shad and LIVETARGET’s Golden Shiner Rattlebait. 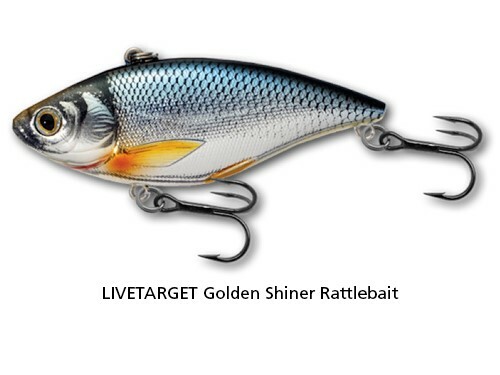 Tackle considerations include a 28-inch, medium-action WidowMaker from 13 Fishing. 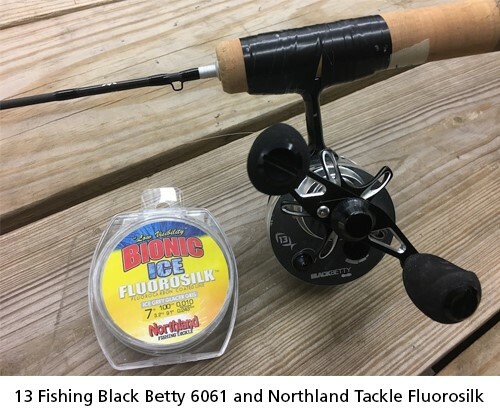 Paired with one of the company’s Black Betty 6061 inline reels spooled with 5-pound Northland Bionic Ice Fluorosilk , it’s perfect for maximizing lure action during the lift, and can handle even the biggest of ice water walleyes. With either lure style, start by dropping the bait to bottom. Raise it with an aggressive lift of 24 to 36 inches, then let it swim back down on a mostly slack line. 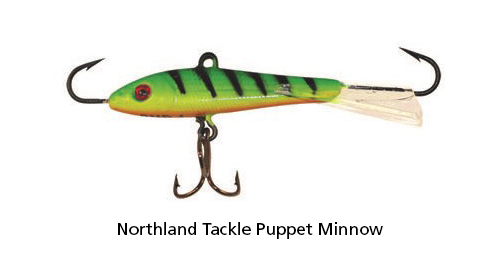 Let the lure settle a second or two—always within 6 inches of bottom—then repeat the process. Don’t be afraid to mix it up with 12- to 18-inch rips, too. In low-vis conditions, rattlebaits and shorter strokes are key, since you’re relying more on sound than flash to attract walleyes. Try a pair of 36-inch lifts, then shorten it to 18 inches, then pop the rod tip 4 to 6 inches a couple times to activate the lure’s rattle before pausing. Most strikes come during the swim-down phase. You don’t know you have a fish until a hungry walleye stops the upstroke in its tracks. When that happens, set the hook, hard. 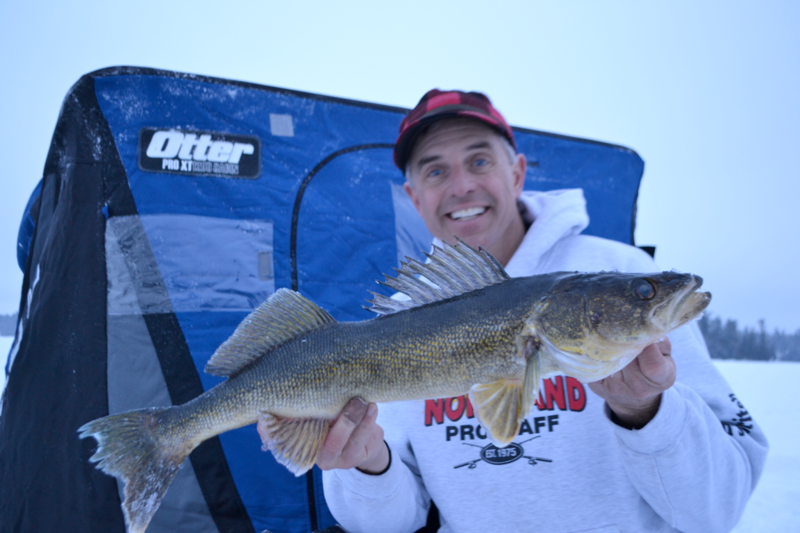 If you think power fishing first-ice walleyes sounds like fun, it is. Just don’t wait too long to try it. There’s roughly a three-week window of opportunity before feeding periods shorten and walleye activity levels begin a steady downward spiral that won’t bottom out until winter’s waning moments.